The Little Tikes Shady Jump 'n Slide bouncer is a backyard inflatable with anarching shade canopy for bouncy fun in the sun! 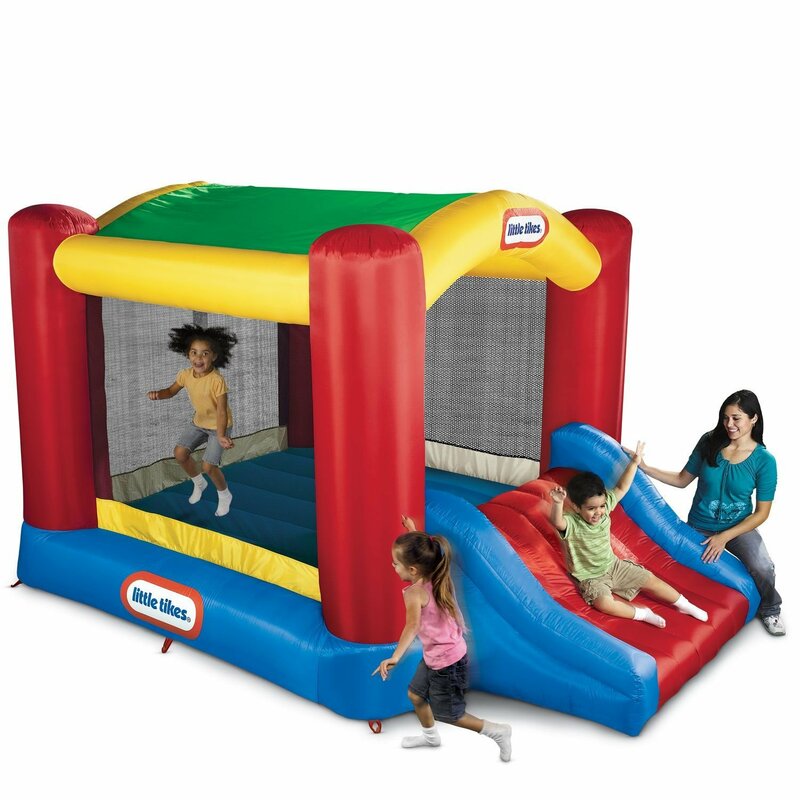 This inflatable bouncerfeatures a slide and large bounce area covered by a protective canopy. Kidscan play together and get great exercise in this timeless bounce house. Themesh sides help keep kids on the bouncing surface. Features: Arched canopy provides constant shade Two mesh doors (on back) for easy entrance into unit Side mesh pockets for shoe storage and other items After inflation, blower must run continuously while children are playing Bouncer must be anchored firmly in place 7-foot wide jumping surface Maximum number of children: 3 Maximum combined weight limit: 250 lbs Product Size: 144.00''L x 108.00''W x 72.00''H Accessories include: 1-Heavy-duty blower with GFCI plug 1-Repair kit 1-Storage bag 4-Blower stakes 6-Bouncer stakes 90 Day Limited Warranty from date of purchase on polyester inflatable fabricbouncer 1 year Limited Warranty from date of purchase on blower Refer to instruction booklet for set-up, storage, maintenance and care Designed for home outdoor use only!